My new camera and I are getting along just fine! Still have a lot to learn, but the macro close-ups are FUN!! I couldn’t resist submitting another #April Flower for my Seasonal Sensations link-up, still going on! If you tried to link Friday, Inlinkz was having issues with my account. Everything is working perfectly, so head over to my link-up page. if you want to link your floral-themed posts. 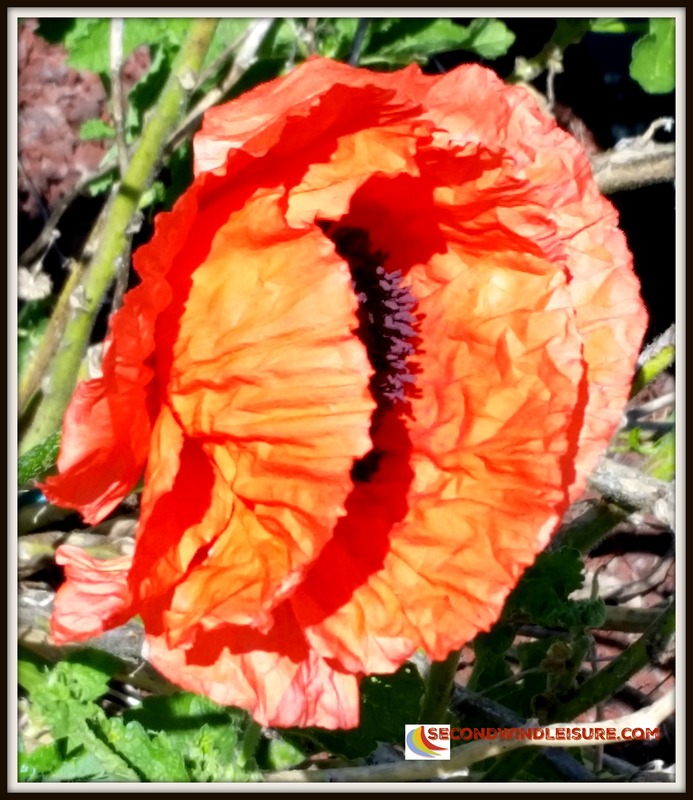 The above photo of a poppy in my neighbor’s yard looks different than the California poppies we now see “popping out at parties” (as a drunk Lucy Ricardo would say after taste-testing Vitameatavegiman). My eye saw something different, but when I downloaded the photos, apparently I had changed the filter setting to HDR and got this papery effect. Other than a little post-editing with PicMonkey, frame, crop, and a little more contrast/shadow, the accidental effect and it’s beautiful orange colors are au naturel. This photo is submitted for Musin’ with Susan’s Macro Moments Challenge, as well as the WordPress Weekly Photo Challenge Dense. As always, I appreciate you stopping by! Don’t forget to link any floral-themed posts! The Doorway Under the Bridge Leads To…? I love the papery poppies. The first time they appeared in my garden I couldn’t recognize their leaves. I was sure they weren’t weeds, but I couldn’t remember what I’d planted that would look like that. 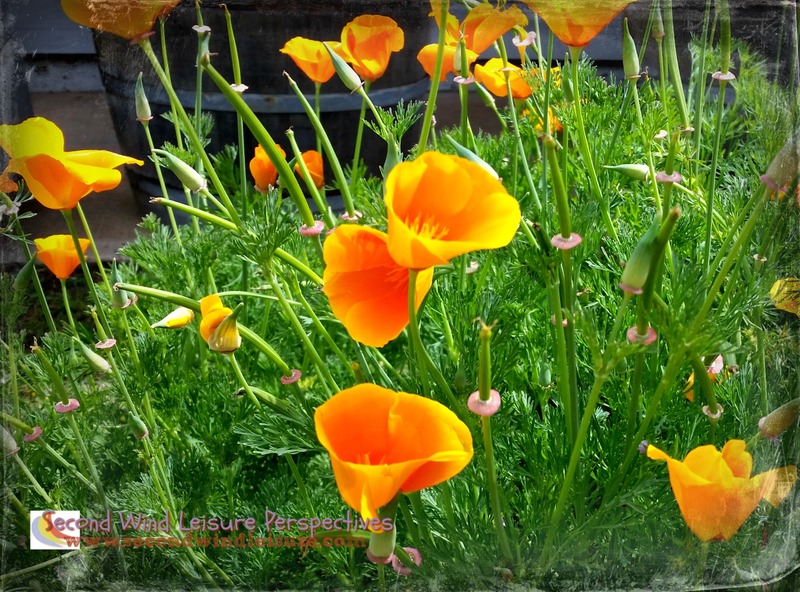 Once they bloomed I had a garden full of Flanders poppies for Memorial Day. It was perfect. Oh, Flanders poppies…thanks for telling me what they are. You are lucky to have them growing in your garden. I have a shady yard, so I struggle with certain flowers like poppies. I am brand new to blogging but I do very much love connecting with other bloggers ! I added my link to your link-up page, tweeted several of the photos and followed most of the blogs that posted pictures. I hope I am doing everything right :)) I look forward to meeting and participating with all the wonderful bloggers here. Such lovely poppies. Thanks for sharing your photos. Living my spring vicariously through you, Terri. We do have some green poking up in the plant beds on the southern side of our house but no blossoms yet. Don’t you love PicMonkey? I use it to and find it is easy and such fun to use. Glad to help 🙂 yes, picmonkey is great! I absolutely love the ‘papery-effect’. Upon first viewing I had thought that they were paper flower! Thanks, it really surprised me too!